I dislike XiMen greatly, it is no secret. However, this place was worth wading through the masses and being half-blinded by the constant flashing lights to get to. It was busy. This was around 18:00 when we arrived one Saturday evening. Honestly, I don’t like the inside of these kinds of ‘restaurants’. But, the food cannot be argued with – it’s good enough to cope with. Cleanliness isn’t the order of the day here, think of it more as grandma cooking up in that frying pan that hasn’t been washed for like 10+ years. In all honesty, it wasn’t the best pork gravy I have had. But, it was tasty, nonetheless. If I am going to order this, I don’t care too much about the health content of the bowl, so give me some silky fat to chew through. This was leaner than most. 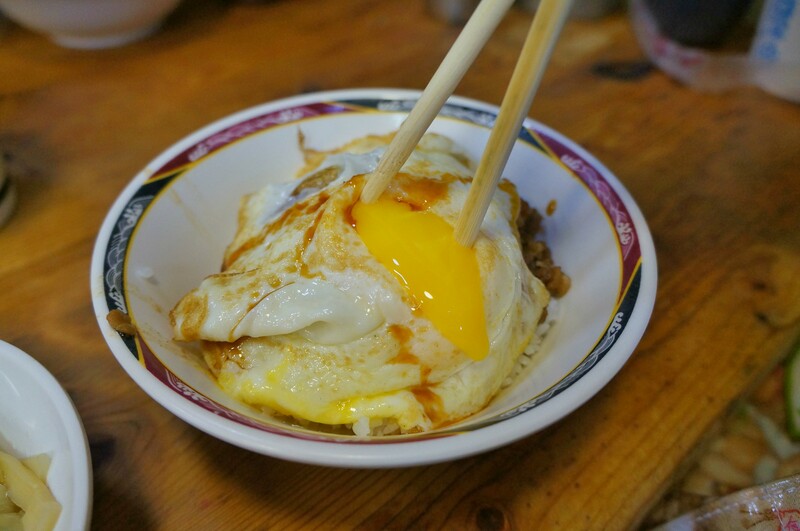 Made extra rich with the egg yolk dripping down. Yes, oyster omelet looks questionable. But, when you bite into one of these fresh oysters, combined with the flavour of the omelet and the slightly spiced tomatoey sauce – win, win! One of the star attractions of this place is the pan fried daikon radish cake. Usually for breakfast, it was definitely a new one for me having it for my dinner. Smothered in the same sauce that the omelet was coated in, with a nice addition to the salty thick soy sauce. The crispy outer crust of the cake mixed with the delicious silky texture of the daikon radish inside was just lovely. Yeh, I could’ve ordered two.